Walking on the field at Rice-Eccles Stadium to see the first-ever NCAA Division I game played in Utah by the University of Utah and the University of Vermont was like a dream come true. The atmosphere that I remembered so well as a kid at Utah Football games was so tangible that I had to pinch myself. This was for an NCAA Lacrosse game. To appreciate the magnitude of what this means for the sport in Utah, you’ve got to understand where we as a sport in this state have come from. READ MORE: Check out Connor Wilson’s review of the Powell Lacrosse Switchback gloves here. I started playing lacrosse in the fifth grade. 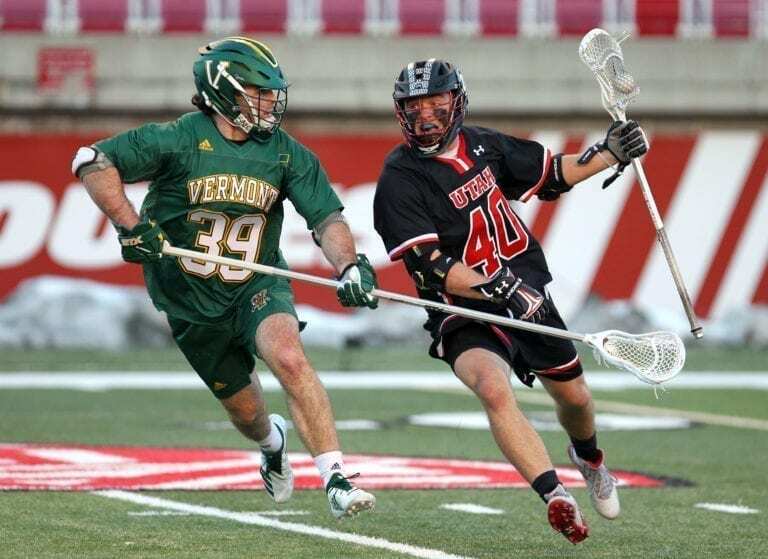 My first lacrosse camp I ever went to was at the University of Utah back when Mason Goodhand (now the head coach at NCAA II Westminster in Salt Lake City) was coaching there. I remember renting some old used gear that was someone’s leftovers from years before. I wore the classic bucket helmet with laces in the back at the camp, while everyone else was in their shiny new C-Pros. This was in the early 2000s. From the minute I started playing the game, I was hooked. It took me a year to play in a recreational league due to the fact that there simply wasn’t one for my age group. My mom signed me up for one as soon as one became available. My mom was also one of the major players in getting lacrosse started in the Salt Lake area. When I graduated to middle school and was told that I could no longer play on a competing high school feeder team, it seemed like I was out of luck as my high school didn’t have one. That was, until my mom created one for me. Over the next few years, I would go from playing at inner-city parks, where we would routinely find drug needles and hear of people being murdered at the park the night before. Salt Lake City is generally a fairly safe place, but the field space availability was such that the fields that no one else wanted were ours. One of them didn’t even have any grass on it. My mom was the one who would organize our teams and fight for field space in order to make sure I had somewhere to play. We didn’t have the luxuries that many high school teams on the East Coast do. But, we did the best with what we had. My story was not unique. I’m sure there are plenty of kids in Utah who have had their struggles growing their program. In fact, I guarantee it. There have been plenty of people like my mom all over Utah that have helped foster the growth of the sport in the state. It had always been my dream to play Division I lacrosse. Back when I played, that wasn’t simply done if you grew up in Utah. There had been a few players who had made it on to rosters, sure, like Matt Maher at Towson who played at Bingham High School, or goalie Chris Powers from Alta High School that received offers from the likes of Cornell, but ended up playing elsewhere. These were my idols growing up, and I wanted to be like them. Utah’s Aaron Fjeldsted from Lone Peak High School in Alpine, UT drives down the field. I remember when I first heard that Utah was hiring Brian Holman from the University of North Carolina and that his son Marcus, as well as Adam Ghitelman (who was one of my favorite players during his college days) and Will Manny would be joining them to take over the club team. 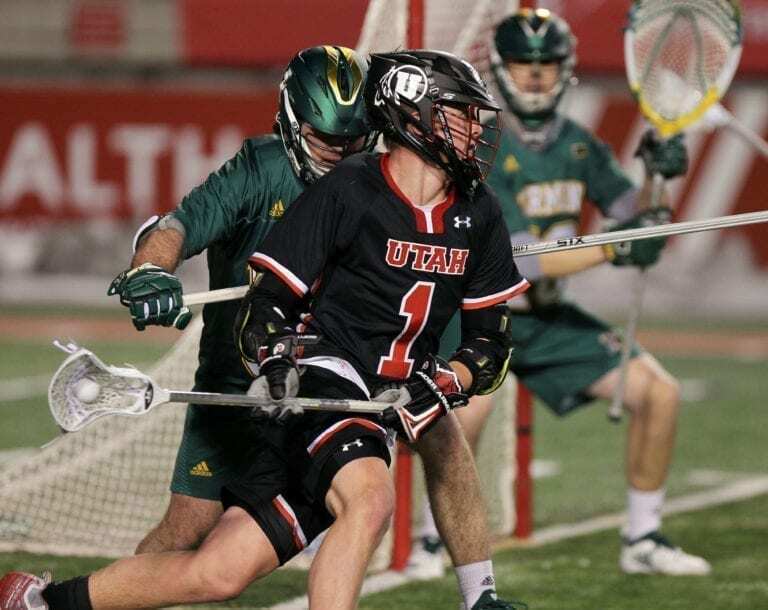 The University of Utah, which had struggled over their existence as a club team for different reasons, had all but certified that lacrosse was headed towards becoming a Division I sport. I couldn’t believe what I was hearing. 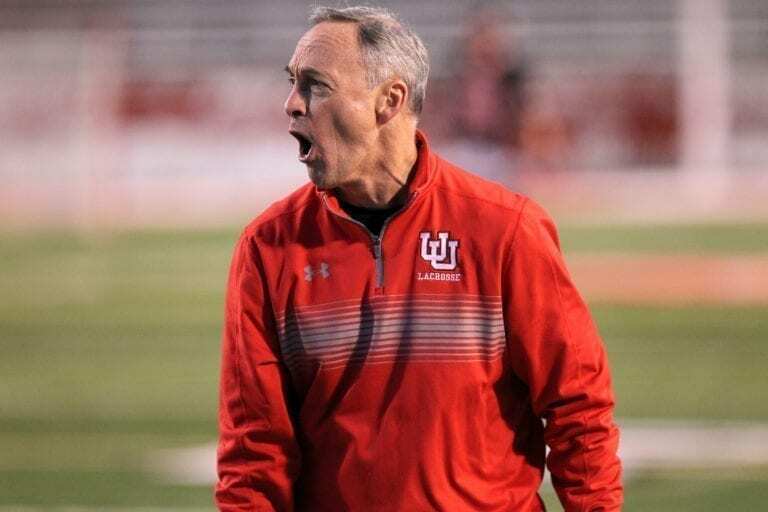 Division I lacrosse didn’t work out for me, but when I heard that Division I lacrosse would be played in Utah, it was like my dream was coming true. While the Utes’ opening game against Vermont was a rough one for Utah, it didn’t matter. Lacrosse was here to stay. There were some bright spots, as hometown hero Josh Stout registered a hat trick in his first NCAA performance as totaled three goals and an assists. His brother, Jake, and Aaron Fjeldsted, also of Lone Peak High School, scored a goal as well. This wasn’t lost on Coach Holman. The fact that Josh Stout scored a hat-trick was icing on the cake. I noticed there were a lot of young kids in the stands. For them, I’m sure that they felt much like I did as a young player who idolized these local college players. For someone who always wanted to be a part of a Division I lacrosse team, tonight was magical. It may not have been me out on that field, but the fact that I could attend a Division I lacrosse game at the university where the majority of my family have gone was something special. There still may be a ways to go for the Utah program, but I already feel like we’ve arrived. That is thanks to all of the many pioneers of the sport in Utah like my mom who have helped the game to grow. This game was for everybody in the Utah Lacrosse community, and to me, especially my mom. That’s right, Mama, we made it. This game was for you.